The role of a district cooling system is to distribute cooling energy from a centralized production plant using an underground pipeline to a district. It is the perfect replacement for older air conditioning systems because of its lower energy consumption, reduced annual maintenance costs, and environmental friendliness among other benefits. Reliable heat rejection methods from ARANER have been influential in the increasing popularity of this solution. Let us talk about two popular ones: Water-cooled and air-cooled condenser systems. Water and air are the main heat rejection mediums for air conditioning systems. When water is plentiful and inexpensive, a water-cooled system, often involving a cooling tower, becomes the most efficient option. If water is unavailable or expensive, air-cooled systems become preferable. ARANER has a wide range of heat rejection systems for all applications. The solutions offer state-of-the-art technology that suits all environments and other requirements. Which is the better system for district cooling? It is not that easy to answer this question. A thorough comparison of the system is necessary. This post covers three angles namely installation, maintenance and operating cost. Why does location feature so prominently when installing both systems? The reason is that failing on this aspect can lead to a perpetual recirculation problem in water-cooled systems. For a tower sited in an awkward position, for instance a hole, it is important to consult Araner for advice from the tower selection stage. Installation of air-cooled systems should be in such a way that no obstruction occurs to airflow on both the air discharge and air intake sides. Avoid placing the condenser near a wall or ceiling to prevent air obstruction. Air cooled heat rejection systems are almost maintenance free. Only sporadic periodic cleaning of air condenser coils might be needed if the air-cooled system is operating in a dirty environment in order to avoid the fouling. If fouling is accumulated, your system will develop higher operating discharge pressure, which may increase power consumption by the chiller. Water-cooled systems also have operation and maintenance issues; although it mostly depends on the quality of water used and surrounding conditions. Does it contain a lot of solids and bacteria? Biocides are popular for controlling bacteria growth. Ozone, being a powerful oxidizer, can also help reduce this biological problem. When water evaporates from a cooling tower, it leaves behind all its solid matter. The only way to deal with this problem is to add water to the tower periodically to compensate for the lost water in a process which is called blow down. It prevents proliferation of dissolved solids, which may cause a bigger problem in the form of scale and rust formation. Generally, maintenance of this system is much more demanding than for an air-cooled system. Traditionally, water-cooled chillers are considered to be much more efficient than air cooled chillers and this is correct for most of the cases and for design conditions. Out of the design conditions the dry bulb temperature is reduced a lot, however the wet bulb temperature is not reduced that much. This means that out of the design conditions the difference in efficiency is not that high and might not justify the water consumption. A typical case is Abdali District Cooling in Amman. Although Amman is a very hot city during the day. However at night the dry bulb temperature is reduced a lot even during summer, while the wet bulb temperature is quite constant during the day. With the help of a long-term thermal energy storage the chillers can operate mainly at night with higher efficiency. Selection criteria of these systems depend on the respective advantages and disadvantages in regards to a district cooling plant. Choose a water-cooled system if water supply is plentiful, ambient air is free of particles and relative humidity is low during the hot season. An air-cooled system is suitable if water supply is inadequate, water supply is unclean and average relative humidity is high during the hot season. It appears that there are many considerations to make when choosing between water-cooled and air-cooled systems. 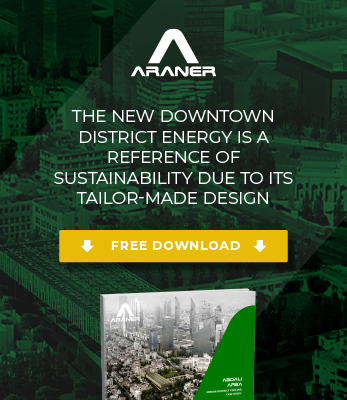 With current technological milestones at ARANER, the notion that water-cooled systems are outright more cost effective no longer stands. Air-cooled chillers are making inroads in areas where water conservation is a priority. Your choice of chilled water system therefore largely depends on location of your plant. Do you need advice on which system is more convenient for you? Contact our experts, they will be pleased to guide you through the best solution. Based on various studies done by manufacturers as well as CTI, water cooled is economical in terms of CAPEX + OPEX. for capacities above 400 tons. Once through systems using water for condenser cooling require maintenance on the tubes as well. Typically for larger applications its water cooled with a cooling tower with water treatment. Efficiency is growing in leads and bounds. Heat transfer coils with micro channel design are really ganging popularity as well. Optimum Efficiency of Air-conditioning/Refrigeration systems is achieved by Water cooled Condensers on the whole. But considering the maintenance cost its advisable to opt for Air cooled Condensers. Currently Large capacity systems are manufactured with Water cooled systems for example Centrifugal Chillers above 750 TR.Its imperative to maintain the Heat transfer efficiency of Condensers to obtain optimum efficiency in any case. I have been looking for this article for a very long time. And finally, I found it. I am very thankful to you and your post also. The air cooled systems are becoming more efficient and economical due to the increasing problems of water availability, contamination such as TDS, TSS, etc., Nowadays if one takes into account all the costs associated with maintaining the components of water cooled chiller systems, air cooled counterparts would win hands down, when properly designed for the ambient temperature of the operating location.